IS NIGERIA REALLY THIS BAD? I need you guys to watch the video and read the article (It's long I know ) and leave your comments below, I want to see what you guys think of it. Is Naija really this bad? Your opinion matters! Which way forward? "Okay, so now I’ve got a post about Melbourne out of the way it’s time for me to say a little something about Nigeria. With the exception of a week in October when I need to clear out my apartment, I’ve pretty much left Nigeria. My assignment there officially finished on 31st July, although I will have to return for business trips over the course of the next 3 years because the project I am on in Melbourne is for Nigeria. Somebody once said that there is much to write about Russia, but when one tries you can never find the words to write the first line. Nigeria is much the same, and indeed there are many similarities between the two countries. I have tried to describe Nigeria to people who have never been there, and failed on most occasions. A colleague of mine stopped telling people back home about the place because he was getting a reputation as somewhat of a bullshitter, even though he didn’t exaggerate anything. I was at a seminar in Paris some time ago and I was describing the working life in Nigeria to a group of Frenchmen. One of them quipped that I was exaggerating and that “it couldn’t be that bad”, which prompted another Frenchman, sitting beside me, to nudge me in the ribs and remark “wait until he does his Nigerian assignment”. He was based in Port Harcourt. Nigeria has a reputation, and I knew about it before I arrived. Most of what I’d heard proved to be completely true. Almost all of it, in fact. To get a general picture of Nigeria, just read the news, and you’ll not be far wrong. It isn’t a place like Russia, the US, or France which surprise visitors when they see the contrast between what they’ve imagined (based on exposure to their tourists or foreign policy) and the individuals they encounter. But beyond the general picture, there are some subtleties worth mentioning. It’s first important to understand that degree is as important as form. Russians, faced with criticism of corruption in their country, often retort that corruption is found everywhere, even in the UK. Which is true, but in many countries it does not infest every authority, office, and institute like it does in Russia. It is the degree, or extent, of corruption which makes Russia different from the UK, not the form. Understanding this concept is important in describing Nigeria. There is no getting away from the fact that corruption in Nigeria has infested almost every aspect of life, work, and society. I can’t think of a single area where I didn’t encounter a scam of some sort. Some of them were pretty normal – policemen hassling motorists for bribes, for example – with others being less common elsewhere. Filling brand named alcohol bottles with local hooch was widespread practice. Not so bad in itself, but these were being sold through supposedly legitimate suppliers and turning up in established bars. Others were unique to Nigeria. I knew a guy in charge of oil shipments for a foreign oil company who received a call from somebody in the authorities saying he was not going to release the multi-million dollar cargo until somebody had bought his cousin $10 worth of phone credit. My acquaintance found himself going to the shop, buying a phone card, and handing it over to some scruffy bloke who showed up at his office in order to allow his crude oil out of the country. The corruption, theft, and graft can take many forms: falsifying a CV (I don’t mean enhancing, I mean pretending you’re a Lead Piping Engineer of 12 years experience when actually, until yesterday, you were a fisherman); selling positions in a company; stealing diesel from the storage tanks you’re paid to protect; issuance of false material certificates; impersonating an immigration officer to access an office, from which you then tap up the people within to fund your latest venture; selling land which isn’t yours; deliberately running down the country’s refining capacity in order to partake in the lucrative import of fuels; falsifying delivery notes of said refined fuels in order to receive greater government subsidies; deliberately restricting the country’s power generation capacity in order to benefit from the importation of generators (which must be run on imported fuel); theft of half-eaten sandwiches and opened drink containers from the office fridge; tinkering with fuel gauges at petrol stations to sell customers short; conspiring with company drivers to issue false receipts indicating more fuel was supplied than actually was; supplying counterfeit safety equipment; falsifying certificates related to professional competence (e.g. rope access work); paying employees less than stipulated in their contract (or not at all); cloning satellite TV cards, meaning the legitimate user gets their service cut off when the other card is in use (the cards are cloned by the same people who issue the genuine cards); the list is literally endless. There is no beginning or end to corruption in Nigeria, it is a permanent fixture. Nepotism is rife: family members are employed and promoted before anyone else. Outright theft is rife: from a pen lying on a desk, to billions from the state coffers. Dishonesty is rife: from the state governors to the street urchin, lying to enrich yourself is the norm. You name the scam, it is being done in Nigeria. Eventually, nothing surprises you. As I said before, you’ll find such practices everywhere, but to nowhere near the extent found in Nigeria. Apparently it wasn’t always like this. There was a time, probably from around the 1970s to 1990s, when Nigeria had a reasonably diverse economy. Besides the oil and gas, they had agriculture, manufacturing and assembly (Peugeot set up an assembly plant in Nigeria in the mid-1970s), brewing (there is a both a Guinness and a Heineken brewery), refining, construction, and pharmaceuticals. Some of these survive today. There were decent universities, and students wishing to graduate had to apply themselves. Security wasn’t much of a concern to the average citizen. I don’t know the details, but at some point in the 1990s one of the military dictators decided to flood the place with oil money in order to buy support. This had the effect of drowning every other form of enterprise and ensuring that oil and gas was the only game in town. This is bad in itself, but by no means unique to Nigeria. What was worse is that this quickly instilled a mentality across Nigeria that there was a lot of money up for grabs, and getting your hands on it wasn’t in any way related to honest efforts or applying yourself to something constructive. Nigeria became a place where if you’re not getting your hands on some of the oil money, either directly or indirectly, then you’re going nowhere. With oil money washing over the whole country like a tidal wave, soon everyone was trying to secure their own piece of the action, using fair means or foul. Imagine throwing a huge box of sweets into a playgroup shouting “Grab what you can!”, and the chaos that ensues will be similar to what happened to Nigeria on a national scale. At least, this is what I gather happened – I may be wrong – but for sure, the current situation reflects what I’ve described. The economy is funded almost exclusively from oil and gas revenues, and everything else is merely feeding off that. The new hotels in Lagos, the growth of capital city of Abuja, the importation of luxury goods, the Audi and Porsche dealerships, the sky-rocketting real estate prices, the money earmarked for infrastructure projects, the increase in flight passengers, all of it is directly or indirectly linked to the oil money. Okay, maybe there is some hyperbole in there. Agriculture still makes up the lion’s share of GDP, and the services sector is booming. Advertising is a big industry in Lagos, although the most common thing you see advertised is advertising space. But nobody is going to get anywhere herding cattle, picking pineapples, or working in a sawmill. Even the owners won’t be earning that much, not if that’s their only income. There is very little opportunity to get rich, or even advance, unless you are somehow connected to the supply of oil money. One of the results of this national free-for-all is the formation of groups, societies, associations, and unions whose raison d’être is to obtain as much money and benefits for their members as possible. This isn’t much different from Europe in respect of trade unions, but groups and subgroups form at micro-levels with sometimes comical precision. The Lagos Association of Road Maintenance Engineers, Roundabout and Lay-by Division, 4th Department. The Nigerian Association of Water Truck Drivers, Lagos Chapter. Membership of one or more of these associations is both essential and compulsory: essential because an individual would get trampled very quickly in the general melee of Nigeria, and compulsory in the sense that you have almost no chance of being allowed to quietly ply your trade without paying dues to some group or other. It’s not clear what the legal standing of a lot of these groups is, but it’s often hard to tell how they differ from a standard extortion racket. One of the most powerful unions in Lagos, the transport union, used to shake down any okada (motorcycle taxi) driver passing through their checkpoints, claiming the money was used “to protect them from the police”. I doubt the money was used in such a manner, but people do need protection from the police in Lagos. Not that the okada drivers had any say in the matter: membership was automatic, and the union muscle would beat any non-compliant driver or confiscate his vehicle. The power of the oil and gas workers unions is legendary, ensuring their members enjoy pay and benefits which are the highest of any local staff in the world, and often outstrip those of the expatriates. This in itself might not be so damaging, but ubiquitous to all competing factions is a rapacity the likes of which I doubt can be found anywhere else on such a scale. There is a culture so prevalent that it is a defining characteristic of Nigeria whereby no amount is ever enough, and no sum too small to be pilfered. There comes a point in the career of most people who have gotten rich, either legitimately or otherwise, where they stop chasing the small stuff and are only interested in adding to their pile if the increase will be substantial. The police chief of a sizeable Thai resort town has his fingers in many pies, but he’s not interested in shaking down street vendors. His minions might in order to supplement their salaries, but generally once the boss has his cut of most of the action, he’s not interested in sweeping up every last baht. As a result, commerce can continue relatively unmolested. The same is roughly true amongst the Sheikhs of the Middle East. Bung the Crown Prince a few million for the contract, and he’ll allow the project activities to go ahead pretty freely. He’s not interested in making an extra $10k by insisting you hire his brother’s lorry fleet to transport the gravel. Such restraint may also be practical: the dodgy official in the UK isn’t going to be interested in taking pennies if he risks getting fired or going to jail, he’ll have a minimum price he’ll work for. But Nigeria has the same problem I saw in Russia: an almost pathological insistence of securing for yourself 100% of everything that is available, and not a kopek or kobo less. I have observed before that Russians would rather have 100% of nothing than 50% of something, and the same is true – but on a far greater scale – in Nigeria. The inequality in Nigeria is horrific. The middle-classes are tiny, those who are neither stinking rich nor mired in poverty. As it happens, most of the Nigerians I worked with fell into this category: lucky enough to have well-paying jobs, but not ordering Porsche Cayennes for each family member. Statistically, almost all Nigerians are dirt poor. A very few are stinking rich. Again, a manageable problem in itself, but the rich haven’t finished yet. Indeed, they’re only just getting started. I spoke to a couple of Angolans in a seminar once, and they said that although their ruling classes had enriched themselves immeasurably, they were at least spending some money on the country, and improvements were noticeable. The reason the Russians accept with a shrug the silovikihelping themselves to millions is because they (rightly) feel this is inevitable and – more importantly – life is actually improving in Russia and has been doing so since they came to power. Sure, it’s a slow improvement and life is still hard, but they are at least moving in the right direction (for how long is a discussion for another post). There have been improvements in infrastructure in Russia, the new Sheremetovo airport to name one example. By contrast – and I challenge any Nigerian reading this to disagree – there have been no discernible improvements in Nigeria in the past decade (outside of Abuja, where all the politicians happen to live). The infrastructure is crumbling, electricity shortages abound, Lagos airport is a national disgrace, project after project gets sanctioned but rarely started, never mind completed, before the funds disappear, and unemployment is rocketing. 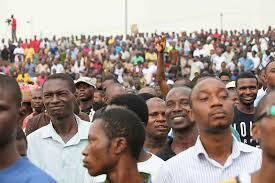 I heard somewhere that 2m people are added to the workforce every year in Nigeria. To do what, exactly? There are no jobs. One source of employment for young men was to drive okadas, until they abruptly got banned in Lagos last year. The roads are now much better, but you now have tens of thousands of young men with no source of income and no hope of a job. Since the ban came into effect, crime – robberies, car-jackings, burglaries – have increased by an order of magnitude, even in the rich neighbourhoods of Lagos previously thought to be safe. It’s not difficult to see why. Meanwhile, Nigerian senators – of whom there are 109 – enjoy an official package worth $1.5m per year, which they recently requested to be increased to $2.2m per year. By contrast, the US President gets an annual salary of $400k. Given the unofficial incomes of a Nigerian senator through graft and backhanders is probably 3-5 times that, we can probably estimate most of these guys are taking home something in the order of $4-5m each year. Yet they put in for a 46% increase, in a country where 45% of the population lives beneath the poverty line. This is hardly surprising for a group of politicians, and far from unique to Nigeria. The problem is, this behaviour is repeated through every strata of society from the very top of the government to the lowest street urchin: whatever is there, I want all of it; and I want more. I saw wealthy middle-class Nigerians move to ensure drivers did not enjoy a fringe benefit worth about $10 per week. If you threatened to report a low-level official for corruption, he would usually tremble with fear of his boss finding out: not because his boss shuns corruption, but because he will want to know why the proceeds of this particular scam haven’t been coming to him. We already had the example of a multi-million dollar oil cargo being held up until somebody’s relative received a kick-back worth $10. If any amount of new money arrives in the economy – due to a new oil project, for example – those who are already wealthy, via their societies, organisations, unions, and political connections will ensure 100% of that new money will go to them. Insofar as sharing and dividing the spoils goes, it is between groups who are already of the same wealth. If any trickles down to the next layer, it is almost by accident, and to be corrected at the first opportunity. I came to the conclusion about 2 years into my assignment that Nigeria is probably the only genuinely classless society I have seen. Class is very different from wealth. Upper class people can be dirt poor (bankrupt dukes) and lower class people can be fabulously rich (Russian oligarchs). Class is about behaviour and attitudes, not wealth (a point made very well in Kate Fox’s excellent book Watching the English). And insofar as behaviour goes, I didn’t see a shred of difference between the top politicians, down through the officials in the national authorities, through the middle class professionals, through the service providers, right down to the area boys. The behaviour was identical across all strata: I want more money, and I will do absolutely anything to get it. If you were to replace the politicians – let’s say our 109 senators from before – with 109 random people from the Nigerian citizenry, you would get no change in behaviour. You could repeat the experiment a thousand times, and you would get no change. There is no ruling class in Nigeria, there is just a set of rulers. Where any change is expected to come from I don’t know. I believe one of the root causes is the bizarre situation where being dishonest is not socially frowned upon. Not really, anyway. If somebody is caught with his hand in the till, he is not shunned by his peers. The whole situation is treated with utter indifference, and sometimes admiration (if the scam is particularly imaginative). Societal pressure plays an enormous role in shaping the behaviour of a population, probably more so than the brute force of the law, and whilst all Nigerians complain about the crime and dishonesty so prevalent in their country (it affects them far more than the expats), they remain utterly silent when a perpetrator is identified from within their peer group. At best, you’ll get a shrug and a statement to the effect of “that’s just how it is”. If you’re a Nigerian caught running a scam against your employer, your colleagues aren’t going to think any less of you. In fact, the only behaviour I managed to identify which would cause a Nigerian to be shunned by his peers and made an outcast, is if he decided he wasn’t a believer and therefore wasn’t going to be showing up in church (or mosque) any more. I don’t think I met a single Nigerian who didn’t attend either church or mosque, and religion plays an enormous – possibly the key – role in Nigerian society. I’m not going to go into this topic, mainly because I’m not reflexively anti-religion, but I do suspect that a lot of Nigerians justify unsavoury behaviour during the week by going to church on Sunday and washing themselves of sin. In this respect, the place is very similar to the Gulf States. Now a reminder of what I said at the beginning of this post. Degree matters. You will find every type of individual in Nigeria, including the kind, funny, generous, honest, and everything else that is good in a person. You’ll find lots of them too. I had the pleasure of working with some great individuals, who were genuinely skilled, could apply themselves, held positions on merit, and were extremely well-mannered and respectful. The team of Nigerians I managed was one of the nicest bunch of people you’d ever hope to meet, and easy to manage as well. (My theory is that engineers are often like this: if you’re bone-idle and want to earn money dishonestly, there are easier things to do than an engineering degree.) The problem these decent people have is that they are vastly outnumbered by those who are not. For every Nigerian who is honest, well-mannered, and diligent you’ll find a hundred whose only goal is to get some money whilst expending the minimum amount of effort possible. If they can use personal connections, lies, or trickery in lieu of learning a useful skill and applying it, they’ll take that option every time. It’s a numbers thing: if 50% of Nigerians were more like 10% of them, the country would be okay. And that’s the fundamental problem of Nigeria summed up in one sentence: way too many dickheads. When I was bored in our morning meetings – which was on most days – I would canvas my team’s opinion on certain things, often the state of the country. They were by and large in despair. Nigerians are famously optimistic, but this is often through desperation. Nowhere was this better demonstrated than on the occasion when a bank put a Christmas tree up on a roundabout with “presents” at the bottom, and the next morning all the presents had been ripped open. If somebody thinks a box under a tree on a roundabout contains an X-Box, then you’ve gone way beyond optimism and into desperation or delusion. My lads were a happy enough bunch – as Nigerians usually are – but had no hope of things getting better any time soon. I ventured the suggestion that a return to military dictatorship might be on the cards, and I got no objection. One of them explained that during the times of military dictatorship, it was only a handful of people at the top creaming off money. Now, with democracy, it’s tens of thousands. And during the military dictatorship, crime was much lower, and few had concerns about personal security. Democracy is all well and good, but I’ve often said that it is a means to an end, not an end in itself. I am sure the world will howl with outrage and impose sanctions should Nigeria undergo another military coup, but few can deny that democracy is failing to deliver peace, prosperity, and basic services to Nigeria. I remain far from convinced that many Nigerians would not welcome such an event. So what did I think of my time in Nigeria? In truth, I didn’t like it, but not for the reasons you might think. The worst thing, by far, was not being able to go anywhere and do anything at the weekends. The security situation did not allow us to travel beyond a very restricted area of Lagos, and even if we could there wasn’t much to do. I like walking about with a camera, camping, exploring by going to a town and drinking lots, skiing, driving around, visiting people, riding a bike, and hill walking. There was no scope to do any of that in Lagos, for reasons usually related to security. That meant for weekend after weekend after weekend there was nothing to do but watch sport on TV, go to the gym, and lie by the pool. Those with families did whatever families do; the single guys went to bars and clubs and picked up Nigerians girls; guys like me – married, single status – didn’t do very much at all. I used the time well, learned French, read countless books, improved on the guitar, and got fit. Nigeria has excellent weather, and even better pineapples, but I would much rather have spent my time doing something else in another place. Those restrictions were by far the worst aspect of my Nigerian assignment. Insofar as the daily life in Lagos went, with all its challenges, that was manageable. You get used to anything eventually, and at some point I was able to shrug off almost everything Nigeria had to throw at me. I never quite got used to the traffic, so used to plan my day to avoid the worst of it. Dealing with the Nigerians took some getting used to, a process that was eased considerably when I figured out they weren’t the most difficult factor to consider. There’s rarely any point in getting upset about locals anywhere, because they are the raw material you have to work with. If you go to Nigeria, you will have to work with Nigerians, so deal with it. Some aspects of it were frustrating no doubt, but what can I do? Nothing. What infuriated me more was that some of the expats I encountered were hopelessly unqualified and too inexperienced to be there. Nigeria is a difficult place to attract talent to, and as such – like a lot of oil towns worldwide – those who end up coming are usually way below the standard that should be demanded. Unbelievably, incompetence and stupidity seem to be imported at great expense into Nigeria. This annoyed me considerably, as it did when I encountered a similar state of affairs in Sakhalin. If you are going to come into somebody else’s country on the basis that you have skills they don’t, you’d better make damned sure you have those skills and they are on full view. If I had a quid for every time I’ve seen somebody fail this basic test in the oil business, I could retire and bump yachts in Monaco with Roman Abramovich. I’m pretty sure I upset a few people in Nigeria, and maybe there were a few who didn’t want me there, but nobody could accuse me of not adding value. Nobody could point the finger at me and ask “Why, exactly, do we keep this guy?” If nobody else, the lads in my team didn’t mind me. I gave them direction, support, and cover and got somewhere close to the best out of them. What infuriated me more than anything was coming across a Nigerian with a reputation for being useless, and on further investigation learning that they’d never been given a job description, never been given any meaningful direction, had no understanding of the context of their job in the department or the department in the company, and had just been plonked at a desk and expected to do something. I came across this far more than I should have, and it pissed me off. Fair enough, if somebody is useless then call them useless; but first you have to give them every opportunity to succeed, and only then can you call them useless if they don’t perform. Hey, you could even call this practice management! There was a serious lack of it in Nigeria. How many half-decent Nigerians are shoved in the corner of an office and written off as useless in this manner I don’t know, but I’ll bet it’s a lot, and it does the place a serious disservice. As final proof that I didn’t dislike the place that much, I signed up to another 3 years of involvement when I had the opportunity to get away from Nigeria for good. I learned some things during my assignment in Lagos, and that knowledge is useful. I know Nigeria, and what it’s like to work with Nigerian companies and Nigerian people on a Nigerian project. A lot of people don’t. I’m used to it, it doesn’t hold any mystery or reason for fear as it did when I first arrived almost 3 years ago. I’ll be back there at various points in the future, but honestly I hope I don’t have to live there permanently again for the reasons I stated. I don’t consider it 3 years wasted – far from it – and I didn’t hate it. There were moments, plenty of them, where I positively enjoyed it. And as assignments in Nigeria go, that’s not too bad." I honestly didn't read through all of this, It was just too much bashing. But i kinda agree with what this guy is saying, except we want to deceive ourselves that its not that bad. as much as he pointed out the not good part i also believe that there are amazing things about Nigeria too and why he decided to put that in an undertone at the end is what beats me. We still have a lot of things to work on in this country. Until we face it and accept the fact that Nigeria is bad and even worse than what he explained we will never move forward. Every single thing this man said was true. Not one lie or misconception was in this write up. Please go back and read the whole thing, it will do you a lot of good. Sisi Yemmie, I agree with tim 100%. Kola is also right in her own way. Yes truly, Nigeria has a system problem which is beyond repair. That system in Nigeria has to crumble and be rebuilt for us to have a credible nation. Yes, Nigeria is that bad. She has a failed me personally as a nation that green passport has added nothing to me. "If you were to replace the politicians – let’s say our 109 senators from before – with 109 random people from the Nigerian citizenry, you would get no change in behaviour." - that sums it up, corruption-wise anyway. At least, he had the decency to give kudos where due. I cannot fault anything this guy has said, so yes, Nigeria is this bad. I will be honest and say Tim didn't say anything new here. If we are very honest with ourselves, we will agree that its the truth. I take exception to a few things, but they are truly insignificant. Look at the way the Nigerian youth think today and you will see a reflection of the entire country. Its indeed very sad but very true too. I read EVERY.SINGLE.WORD. And I have to say that I agree with most, if not all that he said. I've frequently said that Nigeria needs a completely new generation that doesn't know what corruption is. As it is now, corruption is embedded in every class of people in this country. Even cinema workers will short-change customers and keep the money to themselves. I don't think Nigeria can or will change in my lifetime. Tim is unfortunately quite correct. Might be a lil exaggerated, but the facts are there to see. Kola on the other hand is disappointingly rather myopic in her views. She needs to be more rounded in discussing issues like this. Sadly, Tim has spoken the truth. Kola too has just spoken the bitter truth, though it's painful coming from a fellow Nigerian and in that manner. Yes, Nigeria is really this bad. I wonder where CHANGE is supposed to come from. Unlike Tim, the issue I have with Kola is that she is Nigerian and it is her responsibility to fix her country. If she doesn't contribute to solving the problems that she is complaining and running away from, then who will? Tim? You can't just sit comfortably in another man's land, on the back, sweat, and tears of other people's hard work and sacrifices and then make derogatory comments about your own country. That is cowardice. If Kola is really concerned about the state of affairs in Nigeria, she should do something about it. No contribution is too small. It's all about impact! It is not her responsibility to fix her country! Not at all and that is her point. Yes, you can sit comfortably in another man's land and prosper when your own country is as useless as naija is. I don't blame anyone who leaves. We all would if we had the opportunity. I don't agree with your last sentence. Tim was absolutely right in everything he said, I can't fault his views that is what Nigeria is "Very bad". I also have a problem with Kola, if everyone has her mind set WHO WILL FIX THE PROBLEM?. they say little drops makes an ocean, I think its time we all stopped complaining about the terrible situation and start doing our bits. Very long post,yet I couldn't stop till I got to the last word.All he said are the truths,without exaggeration.He may have even tried to thread softly because the situation is worse than he pointed out.The sad part is that,instead of acting to take the nation back to what it used to be,we go to A Nite Of A Thousand Laughs to laugh ourselves to scorn,cos we are the jokes! Good thing is,soon we'd all have to travel to a better place...oh wait,they might put 10million naira bond...or we'd fight back and reclaim our lost glory.So yes Sisi Yemmie,it's that bad,even worse. don't even get me started on the expenses scandal in d UK that reeks of CORRUPTION. Chris Huhne and wife (uk politician)went to jail for EIGHT MONTHS over parking tickets. Something that happened years ago. When you can give me an example of an occasion where a criminal activity of a politician was adequately dealt with legally, then you can continue you can repeat this comment. And note...British citizens did not come out saying 'oh thats nothing' or lets forgive him. The law is equal for everyone and they will stand by it. That is a system that tries to work. Pension funds worth billions of money vanished into thin air. Future nest eggs of millions of Nigerians and we dont even have a court trial talk of prison sentence for the looter and you dare to compare? No one said the West doesnt have corruption. But you know its at your own risk. You get caught you serve time..no excuses. Same with getting shot in the streets of London. there is criminality but it shall be duly investigated and your killers brought to book. Die in Nigeria, you are OYO. Difference? Glaringly Yes. Let's make our country work. daz all. Is Nigeria this bad? It's actually worse! There is good in Nigeria. There are decent people making an impact. There are people in government making an impact. Every country is flawed. Kola lost me after she said something about working hard to get herself to speak English with little or no Nigerian accent. Seriously?? And something about a country that marries off 7 year old girls to old men. Nigeria is not Canaan Land o. I agree but I don't really bother to listen to people who just talk from afar based on things they probably read on Linda or BN. There is good in Nigeria. Loads of good. I would not join those who just spend their time talking about the flaws. What are you doing about it? Or what do you plan to do? Every little helps abeg. Stop this bashing. It's how you talk about Nigeria, foreigners will talk about it. And if you're going to be proud of being a resident of another country eg America, take up some of their traits. Start with patriotism. I think both Tim and Kola are looking at all the bad things in Nigeria and are failing to see even if it is just a fraction of the good. This comes from allowing frustrating elements of life to blind you to all the beauty that lies even in that frustration. Let's start with Tim (I could not read all he wrote because it was too text heavy) but I got the general gist of it. While I understand the frustration behind some of what he wrote as a foreigner on a business mission in Nigeria, it is hard for me to imagine that he lived in Nigeria for 3 years and he could not find one good thing to say about the country. The people, the cuisine, something at least. Again, I did not read the whole thing, so I take it back if he did cover this later on. Then Kola: I had seen her video elsewhere so I did not even bother to click on it here. Her video annoyed me. And that is saying much because it takes a great deal to annoy me. It annoyed me for the simple reason that it was too self-serving. Okay, we get it, you don't like Nigeria and you can't live there. But Nigeria is not going to fix itself and a lot of people who actually live in Nigeria are doing something to fix it. She said something in her video about helping orphans - it was just a sentence which she did not expand on. Perhaps if she had used the the video as a platform to get more people on board to do something with orphan children, it could have been a little more bearable, but she just mentioned it like it was an afterthought. The other thing I thought in watching her video was I am not sure if she is a 1st or 2nd generation citizen of the US/Canada or wherever she lives, but I would take a wild guess that she can still trace her pedigree back to Nigeria and also wildly guess that she still has family living in Nigeria. How does it help their lives or her heritage if you are going around putting out a video like that. Sadly, yes, sadly, I do not live in Nigeria anymore. But whenever, I do visit, I look past the corrupt official who is trying to get money from me the moment I land in the airport and see a land with a rich cultural heritage. I see the people who are making it work in the face of the most obstinate obstacles but are still making it work. From the person who is serving at TFC somewhere in Lekki and had to commute all the way from some place on the mainland to get to work on time, to the person who is riding a keke Marwa all over Lagos just to be able to send his children to school. I am a Lagos girl so my perspective of Nigeria is from there, but I can imagine that this spirit of resilient is reflected all over the nation. Yes, we have corruption, yes, we have incompetent leaders who are looking for what they can get for themselves. But we also have millions of people who are looking to do the right thing and just make this journey called life as bearable as possible. I would like people like Kola and Tim to spend at least half an hour with the average Nigerian like Sisi Yemmie who makes the most awesome vlogs in the face of what I can imagine must be less than perfect internet connection (yes, I clap anytime I see one because I can only imagine all the effort that you put into it). I could go on and on, but I will stop here. Sisi Yemmie, thanks for letting me use your blog as a soap box, I will step down now. Keep doing what you are doing, because you are doing a great job. Naija for life!!! @ anonymous 9:20pm that is why it is good to read the full story before coming to a conclusion. he did talk about good things, just that bad things overshadowed the good. You get an A+ for the beginning and middle of your speech..but sadly an F for the conclusion. The people of Nigeria need you and you can be more effective helping locally than from 6000 miles away.....there is a reason God made you a Nigerian..but KOla, you decided to punt and abandon your people to their fate. Eniwe...go on o...enjoy your latte , order your dinner from the French menu, drive around in your new beamer and Skype your friends in Stuttgart and Weisbaaden...ese o.
Hmm interesting comments. Shame I'm picking bit up much later!I saw Kola's video a few months ago too and was absolutely livid! I understand the anger and frustration of matters we all know are big issues in 9ja but nowhere in her video did she say what her contribution has been. She mentioned something about her passion for helping orphans and it stopped there? (*shrugging shoulders*). Her comment of trying to erase the 9ja accent is ludicrous! I was born in the UK, brought up partly in UK and 9ja I have had the taste of both worlds and yes I kinda know the difference, however, even though I'm still oversees, I feel the pain of our people back home! It's not about complaining but what we do to make a difference no matter how small. Nothing goes unnoticed!.I support a number of charities home and abroad, and blog now and again about the things people do to impact positively on others and the society at large hence my slogan " keep making it happen"
We must not get discouraged, every country is facing crisis of its own. The path is success is so not easy but we keep trying. other benefits so if you are interested write me via my mail illuminatiworldofpopulation999@gmail.com OR WHATSAPP number +2348066163720. MUST WATCH ～ SCARF TUTORIAL! SPOTLIGHT: MEET LARRIE PENIEL ～ M.C TOH QUALITY ! WHAT DO YOU THINK OF DAKORE'S NEW LOOK? G B E S E ! ! ! LISTEN TO OMAWUMI'S NEW SONG ～ SOMORI! WHAT DO YOU DO ON WEDNESDAYS?